Oakes & Parkhurst vinyl replacement windows by Harvey are known for their beauty, energy efficiency, reliability and unsurpassed performance. Engineered to last, our vinyl windows feature multi-chamber construction, 100% virgin vinyl for a true white color, top-of-the-line block and tackle balances which never need adjustment, and the convenience of tilt-in sashes. 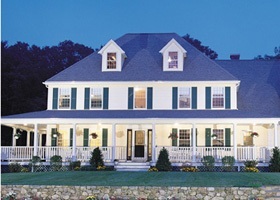 # A - Contoured GBG (Grids between the Glass) give a more traditional appearance than flat grids. # B - Interlock at meeting rail, combined with double weather stripping, provides a triple seal. # C - Easy to operate locking screen. # D - Ventilation limit latch. # E - Multi-chambered extrusions ensure unparalleled structural performance. Sloped sill ensures proper drainage and a weather tight seal. Compare Harvey's multi-chambered extrusions with other vinyl windows. # Harvey's Block & Tackle balance never needs adjustment or lubrication. Compare Harvey's balance system with others. 1 Energy Savings * Low-E glass with Argon gas for ENERGY STAR® qualified performance. * Our Intercept warm-edge spacer greatly reduces heat loss and reduces condensation on your windows. * Multi-chambered vinyl extrusions give outstanding insulating protection. 2 Maintenance Free * Unlike wood windows, Harvey vinyl windows never need painting. * Harvey windows operate as smoothly as the day they were installed for years and years. * Windows tilt in for easy cleaning. 3 Appearance * Sleek design allows for maximum glass area. * Attractive, low profile hardware. * True white vinyl extrusion - other vinyl windows may have a "blueish" tint. 4 Reliability * Our 100% virgin vinyl is up to 58% heavier than other vinyl windows. * Heavy duty hardware will last a lifetime. * ISO 9001 Certification ensures a quality window, every time. 5 Warranty * Each window is registered, in the event you need service. * Harvey has the best warranty in the industry. * While other companies come and go, Harvey has been in business since 1961 and we're here to stay.